Jucy Lucy Restaurants – Think inside the burger. Jimmy on Moving Away from Matt’s Bar? Moving Away from Matt’s Bar? 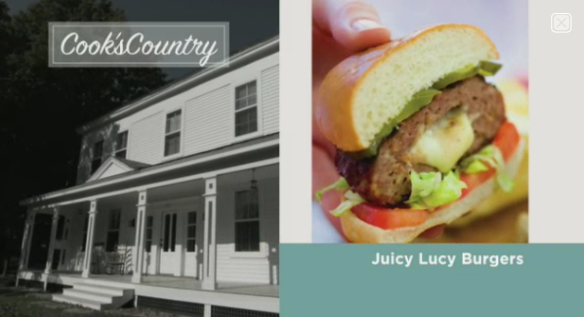 Let’s break down this Jucy Lucy for authenticity’s sake. 1. Cheap bun. That’s no 9-grain wheat bun. It’s simple and white. Check. 2. Pink on the inside? It’s tough to cook beef that’s next to a cool cheese core. Traditional. 3. Gooey cheese. That’s looking really good. Check. 4. Is that cheddar cheese? It doesn’t look like American, so it’s non-traditional. Minneapolis taverns are famous for serving a sandwich called the Jucy Lucy, a moist beef burger stuffed with American cheese. 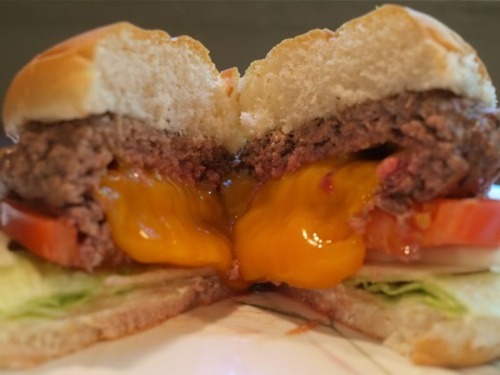 Replicating the Jucy Lucy recipe seemed easy enough—simply seal a slice of American cheese between two beef patties and throw it on the grill. But our burgers, cooked to well-done to melt the cheese inside, were dry and tough. Or worse, the cheese melted through the meat, leaving an empty cavern where the cheese had been. We wanted to figure out how to keep the Lucy juicy and hold the cheese inside. Here’s a link to their winning recipe and a video demonstrating their work. Mad Men’s back, and there is a Jucy Lucy connection. Seriously. EATING I had a Juicy Lucy in Minneapolis. It’s cheese cooked into a hamburger. You bite into it, and molten cheese lava comes out. You can get it at two places in Minneapolis — Matt’s Bar and the 5-8 Club. Goodbye Matt’s Bar, home of the original Jucy Lucy. I am a Jucy Lucy loyalist and have only gotten my cheese stuffed burgers here. I had to make one more stop in before moving to St Louis next week. I will remember you fondly and tell stories of your greatness when I am down south. Posted on November 3, 2011 Author Ed KohlerCategories In the News1 Comment on Moving Away from Matt’s Bar? The Hennepin County Library’s Tumblr account has a write-up of visits to the homes of the two rival originals: Matt’s and 5-8 Club. Also, bonus pics of Matt’s Bar from 1953. If those pics were all you had to go on, do you think you could find Matt’s today? Some things don’t change much, eh? 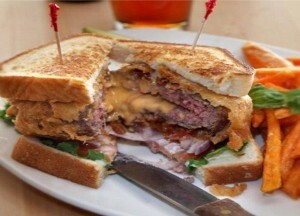 A Groupon for a Jucy Lucy? Yes! It’s not every day that a Groupon pops up for a Jucy Lucy, so take advantage of opportunities like this when they present themselves. Jersey’s Bar & Grill in Inver Grove Heights is pushing a 2-Lucy + 2 Beers combo for $15 today. Posted on September 5, 2011 Author Ed KohlerCategories Jerseys Bar and GrillLeave a comment on A Groupon for a Jucy Lucy? Yes! Our Deep Fried Lucy is the new talk of the town! Hands down one of the most unique and delicious Lucy’s out there. It was just recently featured on Twin Cities Live and has gained a ton of exposure through various media outlets in the Twin Cities. Come down and give it a shot! And bring your appetite! Looks pretty delicious, but I might need some mental preparation before taking it on. Being a Saint Paul guy I would recommend getting out to Shamrock’s or The Blue Door Pub whenever you get a chance (at least until The Nook is back in business). There are other places to try in Saint Paul (I’m looking at you Groveland Tap), but these are the ones that I have been to.I absolutely plan to cross the river to see the inside of Matt’s and the 5-8 Club at some point, but until then I have found what I am looking for in my favorite city. That is some solid advice. But, The 651ery is going to need to cross the river to have a full understanding of the Lucy. Rarely will you find any sort of discount on Jucy Lucys, so this is one heck of an opportunity to save some money on some cheesy deliciousness. St. Paul’s Tin Cup, which offers a variety of tasty Jucy Lucy burgers, including a Dirty Lucy and Breakfast Lucy, has a Groupon offer today only. $8 gets you $16 worth of goodness. Be sure to try out their deep fried Pearson’s Salted Nut Roll while you’re there. One of a kind.